Howlin' Wolf Records: SIX STRINGS: CAPCOM: SUMTHING FOR FREE... and FREE IS AWESOME! NEW YORK (June 9, 2014) - Sumthing Else Music Works, the premier record label dedicated to releasing video game soundtracks, proudly presents the Super Ultra Dead Rising 3 Arcade Remix Hyper Edition EX +α Original Soundtrack from the newly released DLC for CAPCOM's open-world zombie action video game Dead Rising 3 available exclusively on Xbox One. Featuring 35 original songs by Dead Rising composer Oleksa Lozowchuk and various artists including Traz Damji, QUAZR, Stu Goldberg and SKY 13, the official soundtrack album is available from today for free digital download exclusively at http://www.sumthing.com/superdr3/. 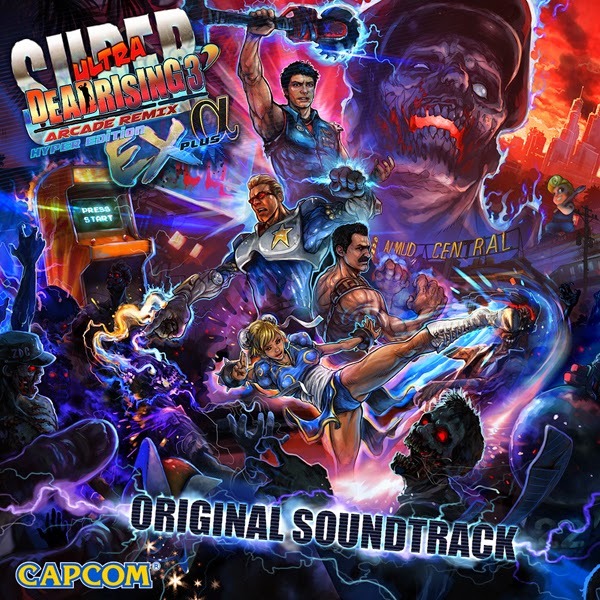 "The Super Dead Rising 3 Arcade Remix soundtrack explores classic sounds, memorable themes, and frenetic beats, mixing them all together into an arcade soundscape of old and new", revealed Oleksa Lozowchuk, Dead Rising composer and soundtrack producer. "It's music made to strike a chord of Capcom nostalgia and put a smile on your face!" Available today exclusively on Xbox One, Super Dead Rising 3 Arcade Remix adds an all new four-player co-op mode to Dead Rising 3. Play as Frank West, Chuck Greene, Nick Ramos and Annie Greene or cosplay as your favorite Capcom characters to use their signature attacks and super moves to save the city from zombie hordes, dangerous shadow bosses and giant super zombies. Compete for the top score, unlock new characters and fight for survival in true Capcom style! As a bonus, Sumthing Else are also offering the expanded 99-track Dead Rising 3 Original Soundtrack, available only on Sumthing.com, at a reduced price of $9.99. Right now, it's free... and free is GOOD!